Not much has been written about ethnographic filmmaker Jean Rouch’s documentary The Human Pyramid (1960) in comparison to the interest aroused by Chronique D’Un Été (Chronicle of a Summer, 1961), the product of his collaboration with sociologist Edgar Morin. While most of his earlier documentaries were filmed in Africa, Chronicle of a Summer is set in Paris in the aftermath of the Algerian war and just before the explosion of social riots that came to dominate that decade. Chronicle of a Summer does not follow an established structure but is driven in an unpredictable manner by its characters and their reactions to the camera. It is arguably Rouch’s best-known work, and has been widely discussed in the context of documentary filmmaking for its innovative cinematic techniques, its choice of scenario (the rough, urban streets of Paris during a significant historical moment) and for being the first film to define itself using the term cinéma-vérité. 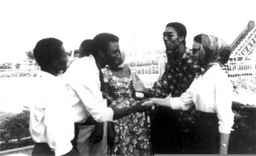 Rouch’ s documentaries are often inspired by a specific context that he wishes to capture; while in Chronicle of a Summer this is Parisian society in the aftermath of the Algerian war, in The Human Pyramid it is the issue of racism seen through the eyes of young black and white students attending a Lycée on the Ivory coast. The Human Pyramid, while possessing some of the same characteristics of Chronicle of a Summer, has a more poetic almost dreamlike atmosphere; it is also much more raw and less structured, especially considering most of it was left in the hands of the kids. For these reasons, The Human Pyramid is simultaneously more and less complicated than its successor. It is simpler because its themes are only moderately connected to society at large, as the world of these teenagers is somewhat separate to socio-historical reality, and more complex because this ‘unreality’ encompasses multiple layers of meaning. The Human Pyramid recalls some of Rouch’s other documentaries made in West Africa, such as Les Maîtres Fous (1955) or Les Homes Qui Font La Pluie (1951), in which the element of the magical and the ritual plays a significant role. At the same time, it departs from his earlier work, and its results undoubtedly influence the approach taken by him and Morin in filming Chronicle of a Summer. Rouch’s work, and Chronicle of a Summer in particular, occupies an important position in debates about the nature of documentary and the relationship between camera and object. His cinema explored possibilities that had not yet been considered, and presented a very different response to the newly introduced technological advancements in comparison to his contemporaries. Bazin, himself, has shown in his own work how such a ‘liberation’ can be simultaneously satisfying and unfulfilling, as it introduces a whole new set of questions far more complicated than the ones that it answers. In the same way, the technological innovations available to documentary filmmakers during the late ’50s and early ’60s created more issues than they resolved. Up until then documentary crews had to use the same cumbersome equipment used in fiction film, with obvious limitations to their recording of events, and forcing them to turn to the practice of reconstruction. Once sound and camera equipment became portable and silent, issues concerning the impact of the filmmaker on the object and its ethical implications had to be conceived of, and addressed, in a different manner. The issue of the camera’s relation to reality, which permeates the fiction film, is addressed directly by the documentary filmmaker, who has always aspired toward capturing the sight and sound of life in an unobtrusive and impartial manner. The ambivalent nature of the medium, which excludes the human element as an intermediary but nevertheless implies a subjective viewpoint, gives rise to issues concerning the camera’s legitimacy to record the ‘obscene’ object of reality. Questions about what degrees of faithfulness to the truth establish a film as a documentary, and whether such faithfulness is even possible, have accompanied the history of documentary filmmaking since its origin. In the meantime, partly due to the technological advancements, documentary underwent a revival, and experimentations with the new technology abounded. 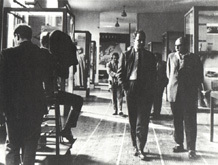 The answer of ‘direct cinema’, which included Richard Leacock, Donn A. Pennebaker and the Maysles brothers as its representatives, was a purist approach in which the impact of the observer on the observed had to be kept to a minimum. Interviews, voice-over commentary and any other forms of interaction with the subject matter were considered to contaminate the result of the observation. Others like, Pierre Perrault, used the new equipment to draw meaning from the seemingly insignificant and the quotidian, attempting to find greater meaning in and unity to the whole by observing and bringing together the small elements of everyday life. Chronicle of a Summer was one of the first films to make use of the innovative equipment, which Rouch himself had helped to develop. The film’s object, nonetheless, was precisely the contamination so painstakingly avoided by exponents of ‘direct cinema’: in the film, Rouch and Morin begin by investigating the nature of happiness by questioning passer-byes in the streets of Paris, but as the film progresses, the investigation becomes a pretext in order to access people’s most innermost thoughts about life and their relationship with others. In this film, Rouch is considered to be responsible for introducing the term cinema vérité, as homage to Dziga Vertov’s ‘kino-pravda‘, referring to his and Morin’s desire to create a reality between documentary and fiction through the camera’s co-existing attributes of objectivity and subjectivity. Subsequently the term has been adopted to describe projects that differ greatly from Rouch and Morin’s, one of the reasons for this divergence lies in the ambiguity of the word ‘truth’, and its complex relation to the filmic image. In essence, the concept’s intention is to unite the main characteristics of the camera and the human eye, objectivity and subjectivity respectively, and to find a new meaning in their relation. Rouch on the one hand grasps the enormous shift in perception caused by the introduction of the photographic image, and on the other, due to his scientific background, comprehends the impact of the observer on his subject matter. In fact, Rouch believes that, considering that the presence of the observer cannot be ignored, it should be taken into consideration so as not to invalidate the results of the observation. His first experiences with the camera come directly from this approach. It is this tension between Rouch the poet and Rouch the scientist that constitutes the uniqueness of his films, and that sees his influence far exceeding his original field of ethnographic film. Rouch recognizes that the facts are always disturbed by the person who asks the question, and through his acknowledgement of the subjectivity brought in by the observer, he can infuse the rationality that otherwise prevails in any kind of experiment with poetic and aesthetic qualities. Rouch nonetheless, faithful to his area of interest as an anthropologist, always maintains a scientific approach to the ‘lies’ that he fabricates. If the principles upon which he bases his observations break the traditional subject/object relationship, his methodology is reflective of his education: he begins his projects by creating the conditions of the experiment, expressing its purpose, and subsequently commenting on the proceedings. There is, therefore, a sharp contrast between his ‘poetic’ principles and his rigorous methods, a contrast that produces unusual and ambiguous results. If “anthropology must destroy what it investigates”, (7) Rouch is not interested in human nature as a lifeless object in front of the lenses, but wants to capture it as it breaths, moves, and evolves; the camera then becomes indispensable in recording life in its duration. Confronted with the knowledge that the production of an image implies the death of the event that it represents, Rouch has no choice but to maintain the signified and the signifier intertwined, creating as a result what Mick Eaton calls “a new cinematic reality”. If, according to Barthes, the photographic image produces death while trying to preserve life, a possible approach to the matter is to render the object and its representation as closely related as possible, generating a dimension that is halfway between the two. This approach, which Rouch explores in all of his documentaries, is obviously riddled with contradiction and ambivalence, and is attributable to his double role as anthropologist and filmmaker. Traditionally, the ethnographic film is considered to be the polar opposite of ‘art cinema’, and while it would be unproblematic to say that Rouch’s work simply compresses the two categories, ethnographic film and art cinema, his work presents so many layers of meaning so intimately entwined that such simplifications are impossible. In Chronicle of a Summer, his attempts to blur the boundaries between subject and object, and to recognize the unique dimension created by cinema, are represented by his and Morin’s efforts “to create reality starting from fiction”. It is necessary for Rouch and Morin to be present in the film and to explain the conditions of the project for their experiment to be valid. In the first scenes, the two are in front of the camera, explaining to Marceline, whom they have chosen to conduct the interviews, her role in the development of the film, and how they will go about the project. Both Rouch and Morin are present throughout the film, even though not always in front of the camera, asking questions and instigating reactions. Before the final scene, the film is screened to its actors/participants and receives mixed reactions. Subsequently Rouch and Morin discuss the results of the experiment in private. The outcome seems to have been unexpected, and they walk off full of unanswered questions. Rouch and Morin constantly provoke their impersonators, even quite crudely, as when Rouch asks a North African immigrant (who also appeared in The Human Pyramid) to explain the numbers tattooed on Marceline’s arm, aware that the young man does not have knowledge of the events of the Second World War. Nevertheless they are exposing themselves too and putting themselves at the same level of the people they film. After that incident, Rouch said that he was ashamed of the cruel smile that he had on the screen while asking about Marceline’s tattoo, but even that simple smile is important in creating perspective for what we are watching, and in acknowledging the conditions under which it was created. It is clear how the presence of this ‘context’ creates a very complex cinematic reality that does not proceed in a linear manner, which in turn arouses feelings of unease in the viewer. In “Cinema Vérité or Fantastic Realism”, Fereydoun Hoveyda describes the film’s inclusion of the context as that of a novel incorporating its notebook. The two cannot be viewed as separate entities, but are inextricably linked and designed to enhance each other’s meaning. The essential point is that the limitations between the subject and the object are blurred and a new space is created from the encounter between the camera and the external world, in which traditional binary opposites such as fictional/documentary, performance/private life, are imploded. This is the result of a self-conscious effort that recognizes that film, while representing reality, constitutes a reality of its own. The fictional element becomes a starting point in order to create reality, allowing the elements of truth to shine through the ‘lies’. Through the screening, Rouch consolidates the reality that he has created between fiction and documentary, but he is also ready to recognize its fragility and limitations, and to destroy it. He does so by inserting into the narrative, just after the screening, the death of one of the main characters (and not a real-life person) in the film under mysterious circumstances. With Alain’s death, once again, Rouch explores the differences between the roles each of us play in different situations, and the reactions that they provoke. Alain dies, disappearing in the waves, during a picnic on a sanded ship. It was his favourite place, as he had confessed to Nadine earlier in the film during an excursion. He said that it was where he felt most comfortable with himself, where he did not feel the pressure of playing a certain role. It is difficult to grasp the meaning of Alain’s death, as it is abrupt, unexpected and disorienting. It suddenly breaks an intricate illusion, creates discomfort, and forces the audience into re-evaluating what has happened until then. This is exactly the desired effect, to shake us out of our assumptions and demand a revised opinion. It is also about exploring the boundaries between documentary and fiction, life and performance, the viewer and the screen. Rouch, as Eaton points out, is also interested in making films for himself and his cast. The death of Alain occurs in order for him and them to realize the limitations of their own experiment, of their own creations. It shows the contradictory nature of the reality that has been created. It is so powerful as to have an actual impact on the lives of the participants, yet so fragile and ephemeral that it can be wiped out like a sand painting. Additionally, it represents a way for Rouch to detach himself from the cast and from the project, and to emerge once again as “the shaman, the master of ceremonies at a cinematic ritual, stimulating and entering the trance with his camera as the magician’s instrument…” (13), ready to perform once again by creating another ‘filmic truth’. Within these multiple reflections of reality, Rouch is both master and actor, and shares with the protagonists a profound experience, because, besides orchestrating it, he participates in the illusion and is invested with its energy. As Deleuze notes in Cinema 2, in order to tell these people’s stories he must ‘become’ them. Perrault commented that “Rouch’s characters are prone to introspection rather than action, they are reflections of themselves” (14). The characters don’t undergo growth or evolution in any traditional manner. Their journey does not conclude at the end of the film, as Denis says in a voice over in the last scene, “The film ends here but the story isn’t over…it’s so much simpler and more complicated but it’s up to all of us to write it”. So he must feel their emotions in order to illustrate them, as their performances are uncontrollable, inundated with spontaneity and improvisation. In a similar way, the actors themselves must become Rouch: this film is not the product of a singular perspective that constructs the events in its own particular way; Rouch steps down from his position as director and allows it to be taken over, injecting the film with multiple points of view and dimensions, only to then step back and point it in a new direction, as with Alain’s death. Similarly, there is no clear conception of time and duration. There is no beginning or ending, or, depending on the perspective, there are many beginnings and endings, as is demonstrated by the two scenes prior to the credits, and the death of Alain. Even in these instances, each segment can’t be analysed singularly as it would loose its significance. As Hoveyda puts it, “one discovers other films in it […] hidden under the first one”. (15) Here he is referring to Chronicle of a Summer, but I believe his remarks are even more relevant to The Human Pyramid. This non-linear conception of time is further complicated by the use of the soundtrack. It is a combination of Rouch’s commentary, the synchronous dialogue and sounds, and the comments made by the main characters, Denise and Nadine, that have been recorded after the film has been edited. They have improvised their speeches after watching the scenes, adding the perspective of their current position to their feelings at the time. Moreover, the synch dialogue and the commentary are continually interwoven and blended with the images. The viewer often forgets which one is being transmitted, the two time frames consistently merging. Because the death of a character is most likely to represent the end of a movie, Alain’s death also constitutes a form of closure before the film ends. The characters created by the young students, which have subsequently become a part of them, can now live eternally, frozen by death, in the fantastic realm of the filmic image. Their world is, in a way, left intact, as immediately after the (fictional) tragedy, the audience is taken to a completely different level. This is because, in spite of the above-mentioned power of the ‘cinematic reality’, death remains the ‘un-representable’. Death constitutes the line that separates (or unites) facts from fiction, performance from life. Even though, via the pretext of fictional circumstances, the students in The Human Pyramid have felt and acknowledged the emotions that the presence of the camera has aroused in them, they cannot experience death without it actually occurring. After Alain’s death, the spell is broken and the viewer is not in a position to surrender his trust to them anymore. The truth behind the “cinema of lies” has been pushed to its limits and has, literally, died. If earlier we did not know where the performance commenced and real life ended, now everything seems fictional, yet, as it has lost ambiguity, plain. The protagonist of a short story by Jorge Luis Borges who is incarcerated and awaiting execution, reflects that “reality does not usually coincide with our anticipation of it”, (18) and proceeds to imagine different versions of his own death in great detail in order to eliminate them from the realm of the possible. In a similar way, Jean Rouch seems to think that cinema’s claim to the real automatically excludes the essence of it, and therefore represents it in his texts, particularly in The Human Pyramid, with such complex and numerous layers that the final product is somehow able to allude to the reality that has remained outside the representation by limiting its possibilities. This explains the impression experienced during the viewing of both The Human Pyramid and Chronicle of a Summer, that what is played out in front of us, what we are entranced by, is the absence of an object rather than the object itself. Barbara Bruni is currently completing her Honours in Film at the University of NSW after studying Screen Studies at Flinders University, South Australia.